The Community Visitors Scheme (CVS) is a national program funded by the Commonwealth Department of Health. The program matches socially isolated residents and home care clients with volunteer visitors to provide companionship. This unique program is about linking bilingual volunteers with socially isolated seniors from culturally and linguistically diverse or gender diverse background who live at home or in aged care facilities throughout the Perth Metropolitan area. The volunteers visit the person for a couple of hours per fortnight and spend some time together doing what they both enjoy: have a chat share a cup of tea, play a board game, go for a short walk in the garden, listen to music together or help write to their family. This is a FREE service for eligible seniors. CVS community visitors offer friendship, social opportunities and a connection to the community for older people who live at home. 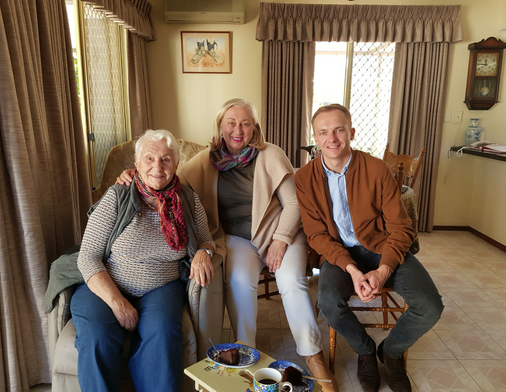 Our volunteers visit Residential Aged Care facilities to support socially isolated residents sharing the same language, background or interest. ● At risk of, or experiencing social isolation. Potential CVS clients can access the program by self-referral or through a referral from their family member or service provider, Aged Care Assessment Team, GP or other health professional. Looking for people to make a difference in the lives of isolated elderly! Our Community Visitors Scheme is looking for volunteers who speak another language and have 1 hour per fortnight free to visit a lonely elderly person in their own home or in a nursing home. Please let us know if you can help! Mr Smith was referred to our Community Visitors Scheme program as his abilities to communicate in English were declining due to his illness and he was reverting back to his original language, Croatian. When I first met with Mr Smith, he was only able to speak a couple of words in Croatian and he was sitting all day front of the television. The wife who doesn’t speak Mr Smith’s language, was very distressed as she wasn’t able to communicate with him. She wanted a volunteer who speaks his language so someone can translate between them because she was so desperate to know how her husband was feeling. When Peter first visited this couple’s house he tried to talk to Mr Smith; however, Peter didn’t seem to be able to communicate with him either. Apparently, Mr Smith kept repeating “No” and “I don’t want to” in Croatian and nothing else. I asked Peter to give a try and visit Mr Smith for a month and see how they go. Peter agreed and started visiting Mr Smith on a weekly basis in last November. He was bringing pictures from Croatia and played music to Mr Smith and it seemed that he was responding to the Croatian songs. Peter, who also plays on a keyboard, sat down with Mr Smith front of their old piano and started playing old Croatian music and sang along with him. That was 2,5 months ago. Last month, I visited the couple again with Peter. Mr Smith was singing to me in his own language and was able to engage in simple English conversation. This is all thanks to Peter’s tireless efforts and his willingness to never give up on people. “[Clients name] is an old funny man with an Italian background. He has a bit of dementia so his English is getting worst and that’s where I can help because I am Italian too. The only little problem is that he speaks a dialect from the south and I come from the north. But it is ok because, as everybody knows, Italians speak with their “hands”.